Tigger is in 5th grade so he is reading the book that focuses on multiplication and division (see below). Read and discuss books- Whenever I plan a study unit, I start with books from my local library. I was amazed at the number of books (and other resources) that were available. While the main point of using the books was to teach a math concept, I also was able to find a way to include a “Reading Focus” as we read and discussed the books together. (And since the grands have to spend time reading as part of their homework, these books can fulfill two subjects on their homework list.) I have summarized and explained how I used these books below. 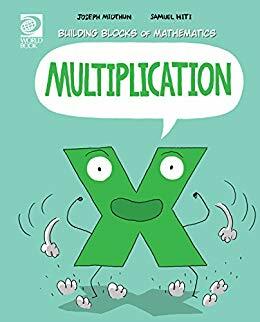 Multiplication: Building Blocks of Mathematics by Joseph Midthun and Samuel Hiti: This is a comic-book style nonfiction book that both Kona and Tahoe enjoyed very much, so we read it together several times. The main characters in the book are the multiplication sign and the addition sign who travel together solving problems, which makes it a good book to use to teach the basic concepts of multiplication and how it relates to repeated addition. The grands also liked using the Multiplication Fact grid chart in the back of the book as well. 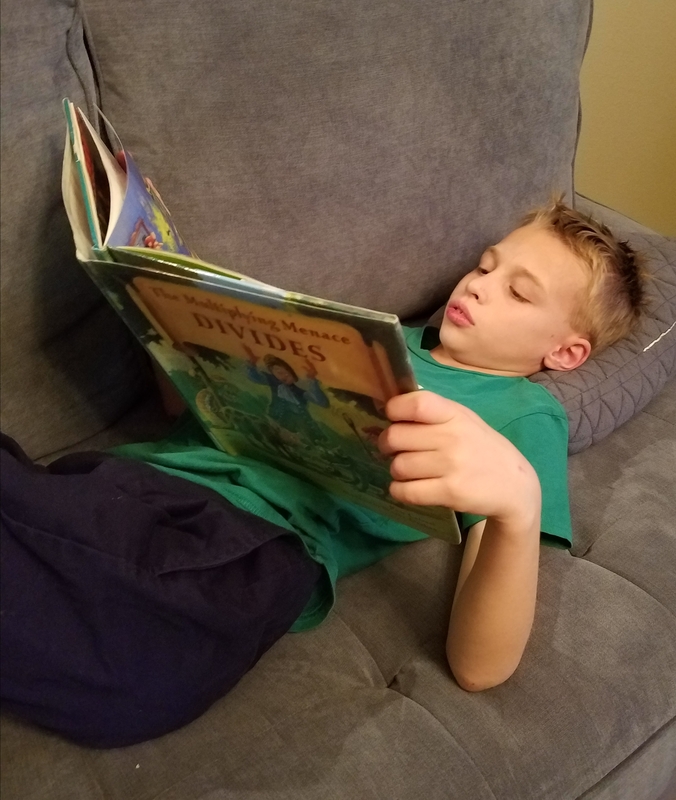 Reading Focus: Group Oral Reading-Since there are two main characters in the story, I had Tahoe and Kona read the story aloud, with one of them taking the character of multiplication and the other grand reading the addition part. Because this book is written in comic-book style, it was easy for Tahoe and Kona to understand which parts they were expected to read. 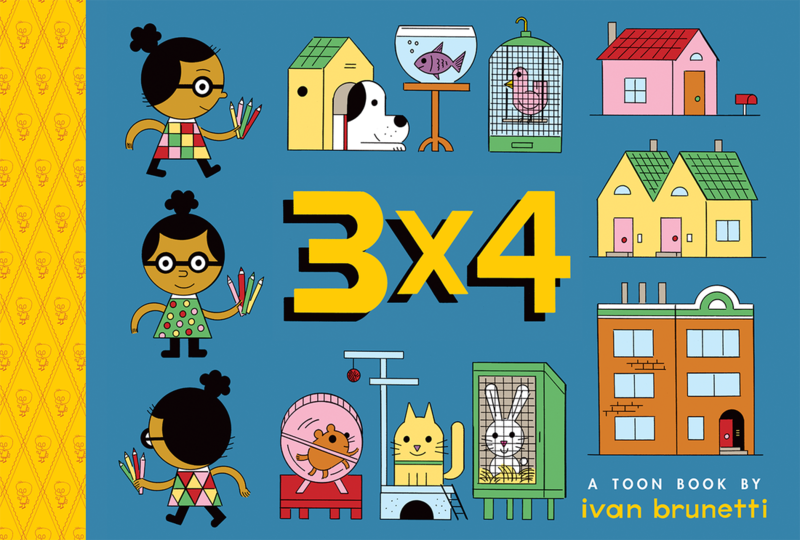 3 X 4: A Toon Book by Ivan Brunetti was one of six year old Tahoe’s favorites, because it focused on art and how it can be used to show a product of 12. The plot shows a teacher assigning his students homework where they have to draw 12 things, but in sets (such as 2 sets of 6 items or 3 sets of 4 items). This book is also drawn in comic-book style, with its many characters choosing different objects to draw in their sets for the homework assignment. It is a Level One reader which is good for Tahoe as a first grader. Reading Focus: Character Analysis-I asked the grands to tell me what they could tell about each character from the objects they chose to draw for their sets. 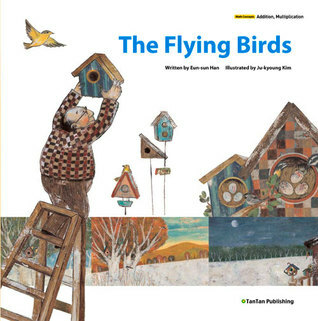 The Flying Birds by Eun-sun Han: This beautifully illustrated book tells a story about an old carpenter making birdhouses who uses multiplication (and repeated addition) to calculate how many birds are living in the houses. At the end of the book, the author has also included a simple game that children can use to practice their times tables. 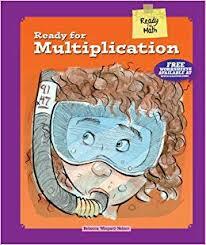 While this book may be too easy mathematically for Kona, since it focuses on the two and three times tables, it does a good job of explaining the concept of multiplication and how it relates to addition. Additionally, it was a good book to introduce the concept of multiplication to six year old Tahoe. Reading Focus: Several different types of birds are part of the story which introduces new vocabulary. 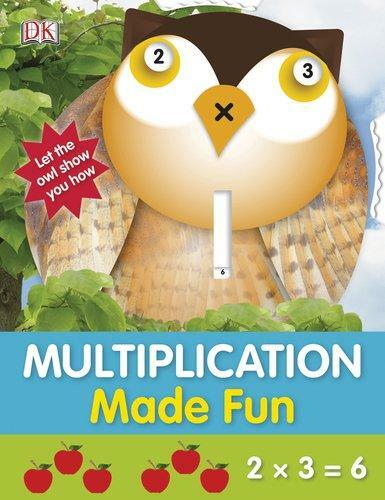 Multiplication Made Fun by Holly Beaumont: Another helpful resource which introduces the concept of multiplication is this book. It has hints for parents on working with their children on their times tables, shows patterns, and includes illustrated word problems using multiplication. I used the beginning of this book with Tahoe, since it explains the difference between addition and multiplication. With Kona, I used the pages with the harder times tables that he still needs to memorize. Reading Focus: We discussed how the word problems were written in the book and key words that helped them know these were multiplication problems. 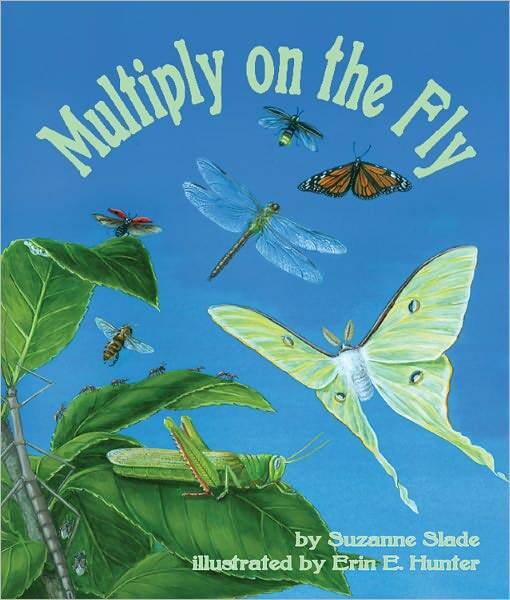 Multiply on the Fly by Suzanne Slade: With beautiful illustrations, this book combines information about insects, multiplication facts, and poetry. The back pages include more information on insect body parts, life cycles and specific details for familiar insects. Since my grandsons are always interested in insects, this is a great book to use with them for reading homework, science, and studying their times tables! Reading Focus: With Tahoe I discussed the rhyming words and pattern in the poems. There was a compare and contrast page in the back of the book which I used to practice with with Kona and Tigger. 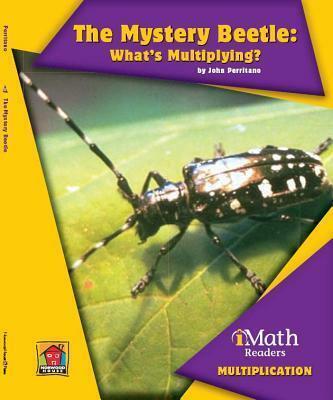 The Mystery Beetle: What’s Multiplying? by John Perritano is also about insects, but is non-fiction. This book is a “Math Reader” which means it includes some math problem solving in a story context. The plot of the story includes a search in the insect room of a museum to match a particular insect the narrator has found. Throughout the story, multiplication problems and strategies are posed or explained. I loved using this book with the grands because it could be used for math and reading homework, with a bonus of being engaging since these boys are fascinated with insects. Reading Focus: This is a nonfiction book that includes many typical text features, such as Table of Contents, captions, a glossary, and an index. I used these features to model and then quizzed the grands on the information they could find by using them. Ready for Multiplication by Rebecca Wingard-Nelson: Besides introducing the concept of multiplication, this book goes even further by discussing key vocabulary (factor, multiples, product), the properties of multiplication (the Zero Property, Property of One, Commutative, Associative, and Distributive), and key words in multiplication word problems. There are also sections illustrating how to multiply with two digits and rounding to estimate. Reading Focus: I love the section of the book explaining how key words are often used in multiplication problems (such as: twice, per, and rate). 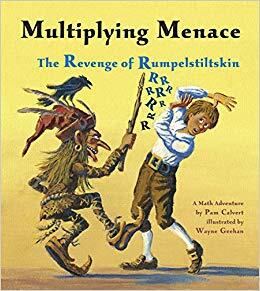 Multiplying Menace: The Revenge of Rumpelstilskin by Pam Calvert reinterprets the Rumpelstiltskin story with a vengeful Rumpelstiltskin using multiplication to cause trouble in the kingdom. This story incorporates whole number and fraction multiplication, so this book is an especially good one for fifth grader, Tigger. Reading focus: We discussed the original Rumpelstiltskin story and how it differs from this version. 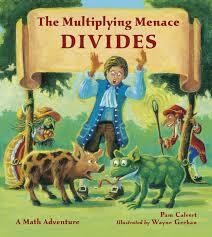 The Multiplying Menace Divides by Pam Calvert is a sequel to The Revenge of Rumpelstiltskin which focuses on division. In this story there are two antagonists: Rumpelstiltskin and Matilda (who turned a prince into a frog in an earlier fairy tale). The antagonists squabble and turn creatures in the kingdom into frogs while trying to locate the Multiplier Stick (which was hidden in the previous story). Reading focus: Since Matilda came from another fairy tale, we discussed the plot of the Frog Prince and how the author used the character of Matilda to create the plot of the story. Skip Counting: One way I help the grands practice their times tables is by having them skip count. For example, this week Kona was getting ready for his 12 times test, so I had him skip count by 12s. The goal is to have him do this as quickly as he can skip count his 5 time tables. We practiced his 12s aloud while we were in the car or taking walks, but he could also write them down too on a dry erase board. Repeated Addition: I can have Kona practice his multiplication tables by using repeated addition. So if Kona needs to multiply 12 x 4, he can write 12 + 12+ 12+ 12 = 48. Hopefully using this method will help him understand how multiplication and addition are related (and motivate Kona to memorize his 12 times tables since multiplication is much faster than repeated addition at this level). Flash Card Elimination: For this activity I used a set of flash cards (such as all the flash cards with 12 as a factor). Then I quizzed Kona on them and separated the times tables cards that Kona didn’t know (or didn’t know quickly enough). Next I had Kona concentrate on the flash cards he didn’t know by tracing the fact in the air with his finger several times (or saying them aloud several times). The next day I quizzed him on these cards again to eliminate the flash cards he had now mastered and kept him practicing the ones he missed. Multiplication Table CDs: There are many musical resources to help children learn their multiplication tables. They can be purchased or borrowed from the library (which is my preference). When the boys are in the backyard or at the park, they can be practicing their times tables too. For example, they can write their times tables with a stick in the dirt or sand. They can set up arrays with pebbles or leaves (such as 3 rows of 6 each). Count the birds we see and figure out how many wings that would be altogether. Find some lizards (or ants, beetles, etc.) and figure out how many legs that must be altogether. Find some clover or flower petals. If each clover has three leaves, how many leaves is that in all? 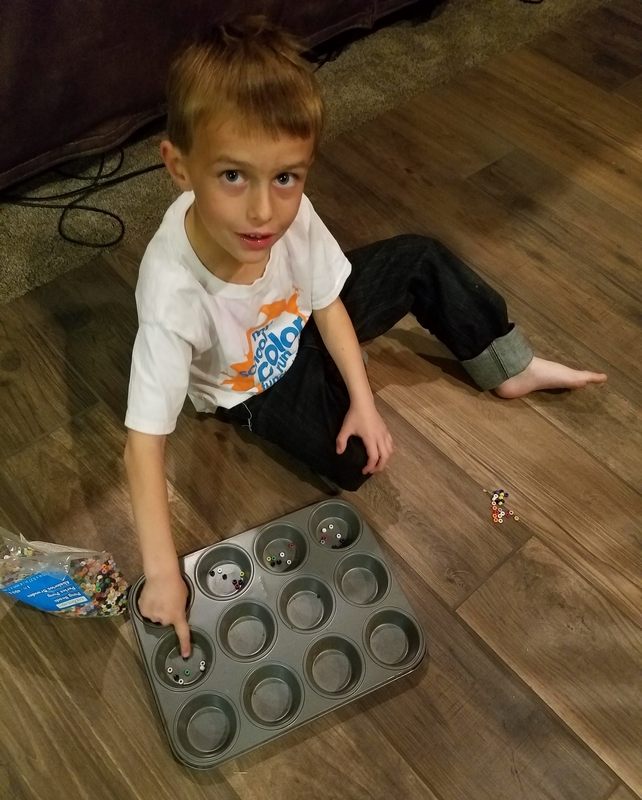 Muffin Tin Arrays: Muffin tins are something most people have in their homes and can be used to make multiplication table arrays and practice skip counting. For example, if I have Kona working on his 6 times tables, I have him put six of “something” such as pom-poms, beads, buttons, pennies, etc. in each muffin tin. This is a great way to visually explain how multiplication tables work. 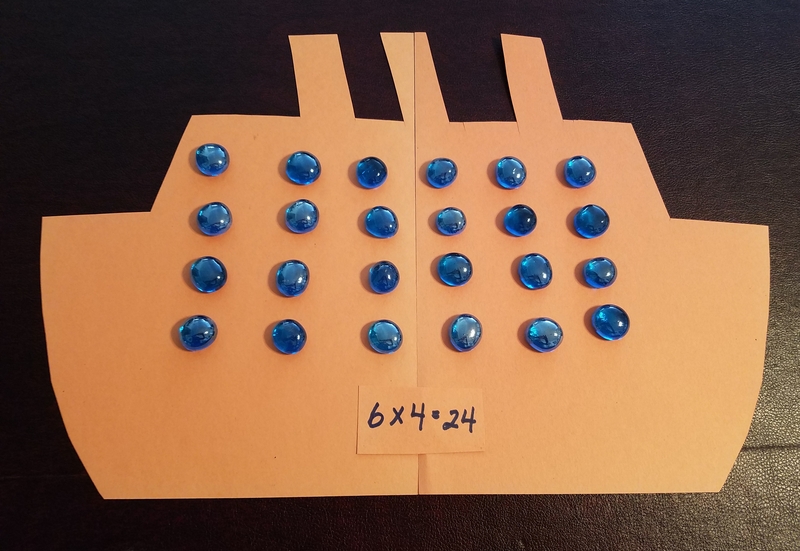 Six year old Tahoe can easily work on arrays using some craft beads and a muffin tin. Other multiplication war games can be played with regular playing cards or dice. When using regular playing cards, remove the jacks, queens, and kings (or assign those cards as 11, 12, and 13 for the older children). The “playing” of this game is similar except each player needs to turn up two cards at once to form the multiplication problem. If you want to play this game with dice, then each player needs a pair of dice and everyone rolls at the same time. Skip Counting with Jump Ropes: In this physical activity, the children skip count while jumping rope. For example, if I want Tigger to practice his 8 times tables, instead of counting his jumps 1,2,3, etc. he would count his jumps as 8, 16, 24, 32, etc. This same idea can be used to count any exercise such as jumping jacks, mountain climbers, sit ups, etc. Hopscotch: The grands can write the times tables they are practicing in the squares of a hopscotch and say the product as they land into each square. 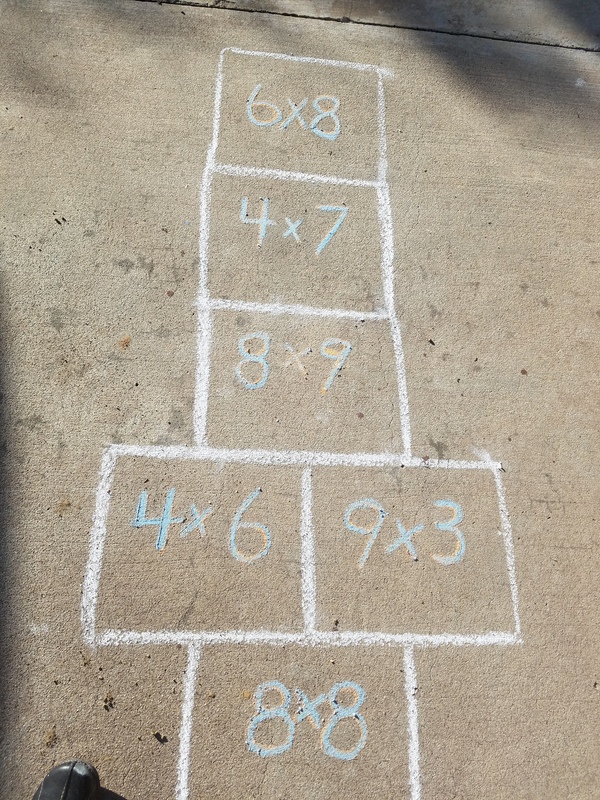 I used sidewalk chalk to create the hopscotch and times tables for each square. If you don’t have a sidewalk or driveway that you can use to create the hopscotch, the garage floor might be a good place to draw the hopscotch. Kona works on tiling task cards to study his multiplication tables. My grandsons can always read any of the multiplication books (I have mentioned in Linguistic Intelligence) on their own. The grandsons also have access to flash cards to use when they want to practice by themselves. 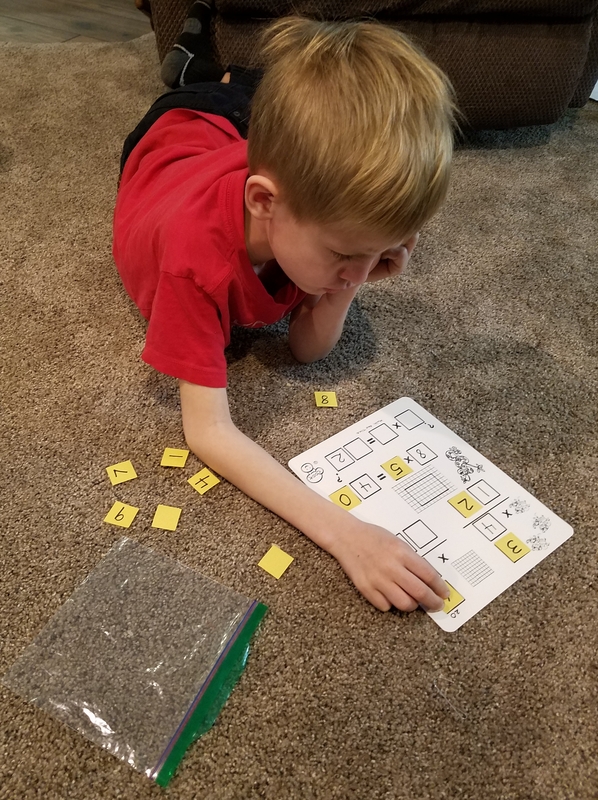 I have purchased some Tiling Task Card Packets (from Marcy Cook Math) that focus on multiplication and the grands can use them and check their answers on their own. (I created my own “tiles” with construction paper, but they can be purchased as well.) I started with Multi Rep Tiles with Kona because the cards have a visual representation to help him and these can be used by Tahoe too after I have modeled for him several times how to use the representations to find the answers. If you would like to see more of these unit studies as I create them, you can become a follower of this blog.